Saturday morning I woke up at 11:00 a.m., exactly 12 hours after I fell asleep. Yes, I slept 12 hours straight. And it was amazing. All that sleep put me in a wonderful mood, and I decided rather than have boring toast, that I would make pancakes for breakfast. Problem was, I didn’t have any Bisquick. 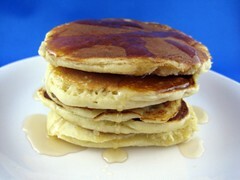 Determined to make still make pancakes, I searched the Internet and found a plethora of recipes. I chose this one, because really, how could a recipe with five stars and more than 2,500 reviews be bad? And it wasn’t. It was delicious! These pancakes are light, fluffy, and oh so yum! Plus, they didn’t take much more time than pancakes from a box. The only change I made was the addition of vanilla, because my mom taught me to add vanilla to everything I bake. Please ignore my oblong and funky shaped pancakes. I think the last one I poured ended up somewhat circular. Pour buttermilk into large bowl. Combine flour, sugar, baking powder, baking soda, and salt in a medium mixing bowl. Whisk egg and butter into buttermilk. Pour the flour mixture into the wet ingredients and whisk until lumps are gone.